Words Come Out | W. Wayne B. Words come out and time slips away. My phrases falter as I weep. Each moment is a burden today. The streams of my mind are dry. Emotion wells up in my heart. My thoughts are full of sad words. A love of life comes only briefly. It leaves me behind despondent. I try to escape the day’s woes one more time. In the distance, a bird wings through the sky. Its feathers are shimmering in the moonlight. I feel worthless compared to that beauty. 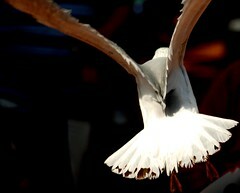 This entry was posted in Poetry and tagged beauty, birds, life, moonline, sky, thoughts, woe, words, z1621. Bookmark the permalink.